Cembrit HD (heavy duty) board has recently been installed in the newly redeveloped East Stand at Twickenham, the home of England Rugby. 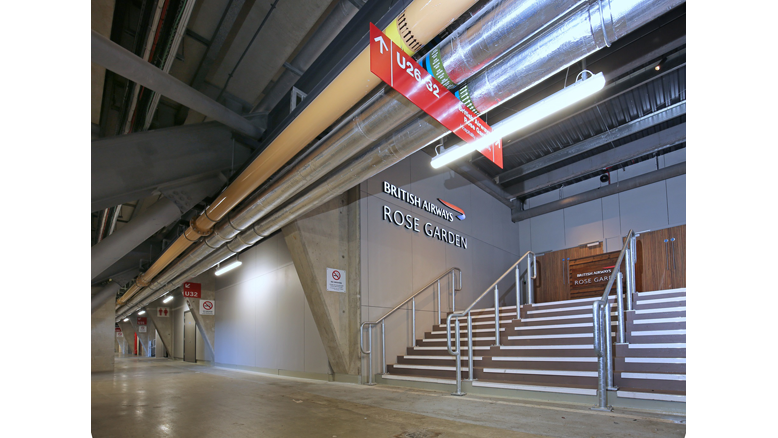 Resilient, hard wearing and with an impressive fire rating, HD is an ideal multi-use board for high traffic areas in sports stadia such as Twickenham, which on match days sees 82,000 fans descend on the stadium. The new East Stand development is a stunning, world class facility. KSS was the lead designer and architect on the project and worked with Wildfire London on the interior design concept and delivery. The expanded East Stand offers six floors of stylish event space, including eight brand new facilities delivering a bespoke hospitality experience for fans. The British Airways Rose Garden is the new elegant roof terrace on Level 5 and has been designed for a fun and immersive experience. Hugely popular due to its ‘outdoors feel’ which includes a built-in pizza oven and rotisserie, the venue sees a lots of foot traffic on match days. Cembrit HD (Heavy Duty) is a Class A2-s2, d0 fire rated high density building board comprising cement, cellulose and mineral fillers. It is ideal for ‘sealing’ buildings under construction as it is impact resistant and can be left exposed without additional treatment. HD is also extremely versatile and can be used as partitioning and is popular in offsite and SIPS construction as well as internal applications.